Listen to the voice inside you. It’s telling you to go. JaBig, a Montreal-based DJ, buys a bike on a whim and decides to attempt to beat the record for the longest continuous bike ride in a single country. What’s more, he’ll ride a single-speed, fixed-gear bicycle and finish in the winter, approaching the Arctic Ocean by way of Canada’s northernmost continental hamlet, Tuktoyaktuk in the Northwest Territories. We pick up with him as he’s closing in on his endpoint along a 188km-long ice road. In his final kilometres, he falls more times than he has in the previous 17,000km combined. Like many people from immigrant families, I grew up in a house full of expectations. My mother is a doctor and my father is an engineer, and whether it was stated or inferred, I felt the pressure to achieve. It wasn’t until after my second master’s degree in science that I realized my artsy passions (that I thought would forever be weekend pursuits) could be my career. I love making sports films. 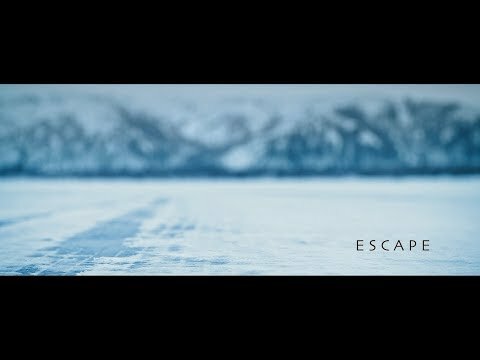 Like the way my first feature, “Gun Runners” (2016), was less about running and more about what it takes to change your life, “Escape” isn’t about the quintessential hero or the quest to break a world record. It’s about vulnerability, and what we do with the weight of the expectations in our lives. Anjali Nayar is an award-winning storyteller and technologist based between Nairobi and Montreal. Anjali’s newest documentary feature, “Silas” (2017), profiles activist Silas Siakor and his network of citizen reporters who are using smartphones to expose land grabs and corruption in West Africa. The film premiered at TIFF in September 2017 and has gone on to festivals around the world. Anjali’s feature directorial debut, “Gun Runners” (2016), tells the story of two Kenyan warriors who trade in their AK-47s for marathon running shoes. It premiered at the Hot Docs Film Festival and is now available on Netflix. Anjali is currently directing “Just a Band,” a fractionally fictional documentary about an Afro-electric pop group that wants to go to space, as well as a number of short creative and virtual reality films. Beyond film, Anjali founded TIMBY (This Is My Backyard), a suite of digital tools that help activists report, verify and tell stories safely. She has reported extensively for Nature Magazine, Reuters, the CBC, France 24 and the BBC. Anjali has a master’s degree in documentary from the Columbia University Graduate School of Journalism, a master’s degree in environmental management from Oxford University and a graduate degree in space science from the International Space University.